In December we reported the data breach at Target, a US based retailer impacting 40 million customers. In the meantime the company announced that 70 million of its customers would be at risk. The company stated that as part of Target’s ongoing forensic investigation, it has been determined that certain customer information — separate from the payment card data previously disclosed — was taken during the data breach. 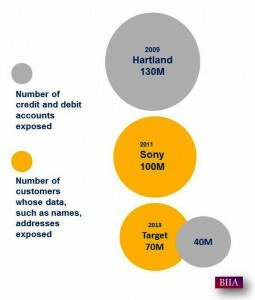 Thus the data breach is much larger than previously reported. What is at stake for the company? It knocked off 20% of its quarterly profit for the 4th quarter as sales declined by 2.5% in the fourth quarter. Customer will have zero liability for the cost of any fraudulent charges arising from the breach. To provide further peace of mind, Target is offering one year of free credit monitoring and identity theft protection to all guests who shopped our U.S. stores. Guests will have three months to enroll in the program. Additional details will be shared next week.